The Vaal University of Technology is proudly managing the Energy and Resource Efficiency advancements project under the Skills for Green Jobs. This project started in February 2016 wherein VUT committed to building the new Combined Heat and Power (CHP), and Dual Fuel technological capability within the VUT Technology Station based on the existing institutional competence through fully utilising its staff, existing equipment and organisational structures both within the Technology Station and University. Following the training provided by Prof. Dr.-Ing. Lars Kühl which focused on equipping the staff and interns on system modelling and simulations know how to optimise the energy consumption in buildings, an opportunity arose that would see the students participating in this project to gain practical exposure in Germany for three weeks. Prior to the Germany practical exposure, it was suggested that the students gain practical exposure to physically see the CHP technology at work and how it is set up in the industry. The VUT industry partner, Pegasus Engineered Green Mobility, arranged for the three students to spend time at a biogas powered CHP plant that is operated by CAE Namibia, at the Gammams waste water treatment works of the municipality of Windhoek. This opportunity offered the students invaluable exposure to an operational CHP plant, running 24/7, and for the students to gain practical insight into the operation of a dedicated biogas engine, the way and the magnitude of waste energy that is available from the system, and how the energy is applied in the biogas production facility. Pegasus partner, Mr Lovell Emslie and Mr Andre Brink from CAE SA, provided the students support while they are in Namibia and prepared the students for the technical activities that they were to participate on. 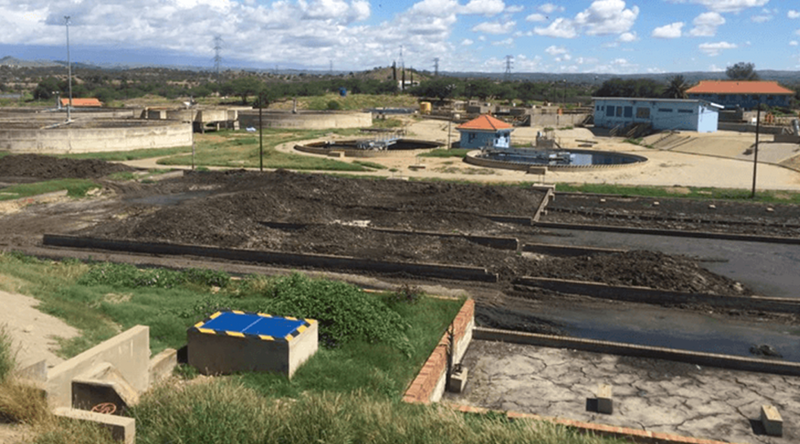 Figure (a): Part of the site of the biogas powered CHP plant that is operated by CAE Namibia at the Gammams waste water treatment plant in Windhoek. Practical exposure to the fields of study in a German company using CHP and Dual Fuel technologies in close collaboration with Prof. Dr.-Ing. Lars Kühl. Figure (b): VUT S4GJ students with German delegates, from left; Prof. Dr.-Ing. 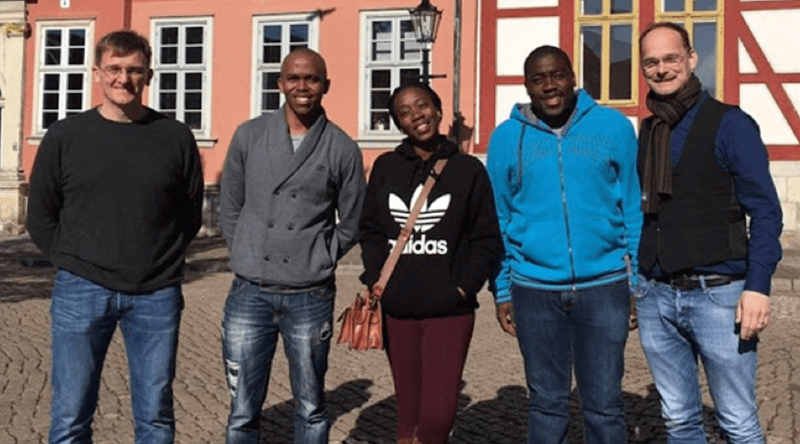 Lars Kühl (Ostfalia University of Applied Sciences), Mr Kabelo Mamadisa (VUT student), Ms Vhukhudo Matidza (VUT student), Mr Hanyani Makhuvele (VUT student) and Mr Frank Waeltring (Mesopartner). The students have acquired invaluable knowledge and expertise throughout this project, and with confidence have affirmed that this project has inspired them to further their studies in the fields of Renewable Energy and Energy Optimisation.